For a no obligation quotation visit our "Contact Page". Certech Registration Inc. is accredited to provide ISO 14001 Registration/Certification by ANSI-ASQ National Accreditation Board, and all certificates internationally recognized and accepted. ISO 14001 "Environmental management systems - Requirements"
The document 'ISO 14001' 'Environmental management systems - Requirements' is published by the International Standards Organization, based in Geneva, Switzerland, and is available in electronically from www.iso.ch. ISO 14001:2004 identifies the management system elements required to ensure the effective control of environmental aspects and related impacts. Flowcharts are provided below identifying the management system elements and their interconnection. In essence ISO 14001 requires an organization to identify its environmental aspects. Frame the aspects within its environmental policy; define objectives and targets to achieve an identified level of environmental performance, which at minimum focus on pollution prevention. Identify risks to environmental performance and take actions to mitigate these. Plan to achieve its objectives and target. Implement the plans and monitor and measure them for effectiveness. Analyze the data from the monitoring and measuring processes to provide management with factual information to change and improve the system to further enhance environmental performance. 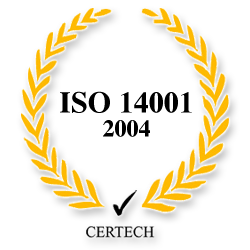 At Certech we believe that the audit process should be about good communication between the Client, Auditee, and the Auditor. Our approach to registration ensures that the auditor is at your facility for all of the important stages of the audit process. Stage 1 allows the auditor to understand your business and its aspects and impacts, and to provide context when completing the audit of your system. Stage 2 allows the auditor (armed with knowledge of your business, its aspects and potential impacts (from the Stage-1 audit) to establish the effectiveness of your system in meeting the requirements of ISO 14001 and your stated objectives.